Human Motion Lights Up Subways | TonerGreen - Eco-Friendly Toners from the U.S. Potential energy sources are indeed just "under our noses". Kinetic energy, the energy stored in moving bodies or objects, is one perfect example. In fact, some of forms of renewable energy actually use kinetic energy to harness energy from other source. For example, wind turbines make use of kinetic energy to produce energy from the wind. It passes on the kinetic energy from the wind to the turbines to generate power. Some of the tidal and wave energy devices also utilize the kinetic energy of moving water to produce power. But the mere mention of "kinetic energy" calls to mind human motion. Yes, human motion can generate electricity. But the development for technologies that can harness electricity from human kinetics are still in the early stages of development. One of the earliest efforts on this is at the Tokyo Station which is one of the busiest train stops in the world. 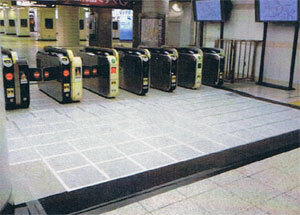 The station has installed Hatsudenyuka tiles. Hatsudenyuka tiles are piezoelectric so these can convert applied strain to electricity. As of now, only trials are underway with the tiles converting the pressure and vibration of human footsteps to electricity that can power the station’s lighting system. Engineers from the University of Leeds in England are also conducting their own similar experiment but instead of a subway, they utilized the motion of marching soldiers. The English had thought of using marching soldiers to eliminate the errors brought about by variation in people’s walking patterns. With marching soldiers, it is assured that the pressure and vibration are uniform. The devices used in Leeds are different from those used in Japan as these contain ceramics and crystals. Although they are currently used on roads and pavements, engineers are hoping that these piezoelectric materials will soon be installed in other places like on soldiers’ backpacks or around the knee to keep the weight of the soldiers’ backpacks down since they no longer have to carry extra batteries for their devices. So far, these piezoelectric technologies are still in their trial stages. There are other technological innovations in the market that can utilize human kinetic power to generate electricity. One good example is Orange, a mobile phone company. It has been testing human kinetic motion charging devices for their phones. The company has recently unveiled their new product: a 180-gram charger which is about the size of a pack of cards. This device is strapped to the biceps of the user so that when the user moves his arms, the action can create electric currents. By far, the only downside of devices harnessing energy from human kinetics is that the source of kinetic energy is not entirely reliable. Humans have the tendency to get tired and to slow down so this may cause certain variations in the energy supply.